Welcome to the Journal online! 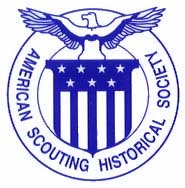 The American Scouting Historical Society is now making the Journal available for download via the Internet. We invite you to take a look at our articles. The Journal Number 7 Auction! - Click here to view color images of the items in the Journal Number 7 Auction. If you don't have a copy of Adobe Reader to view the Journa, then simply click on the "highlighted" text in the last row of the chart below. The program is free and only takes about 20 minutes to download at 28k. Journal of the Amercian Scouting Historical Society Number 7. (1999) OA cards, merit badge varieties, 479 S1 'green fluffy', Honor Camper Tribes, Juniata Lodge 103, Lone Scout Postcards, lodge charters , and The AUCTION!